IBIKEMPLS.com - it's where I get all my news: Comic Art Show - Opening Reception is Friday! I [Andy Singer] am helping to put together a group show of cartoonists at FrameUps (Capstone) Gallery, at 43rd and Nicollet Avenue in Minneapolis. The show will run from August 28th through September 30th. The opening reception is on Friday evening, August 28th from 6-9 pm. You are all invited! There'll be food and booze. 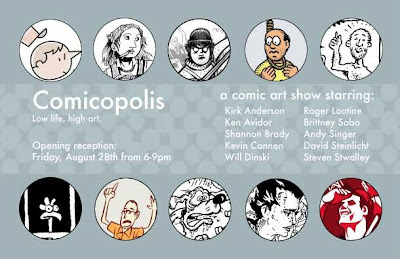 Come booze, schmooze, read comics and meet local cartoonist low-lifes!